In medium size bowl, stir together flour, xanthan gum, baking soda, cinnamon, ginger, cloves, and salt. In stand mixer, using paddle blade, cream together the butter and sugar. Add the egg and blend. Add corn syrup and molasses and blend. Scrape down the sides and switch blade to dough hook. Add flour mixture and mix until it forms a heavy dough. By tablespoonful, roll dough into a ball. Roll ball in sugar and place on an ungreased cookie sheet. Flatten each cookie slightly with a cookie press or a flat bottom surface before baking. Bake for 12 minutes. Remove from oven when the cookies are barely done. The surface will be cracked but the cookie shouldn’t be hard. Cookies will fall flat and harden a bit once they are cooled. This entry was posted in Baking, Recipes and tagged celiac, Christmas, cloud 9 flour, cookies, GF, gluten free. Bookmark the permalink. Yum! These looks so scrumptious! Thank you for sharing! This is my father’s favorite cookie – love that I can make them and enjoy them now too! You’re so welcome! Hope you enjoy them as much as we do! Please let us know how it goes! I’ve never made the butter cookies because Geoff likes English shortbread and my om always makes enough of these to share 🙂 (many times over!). Oh, lovely! 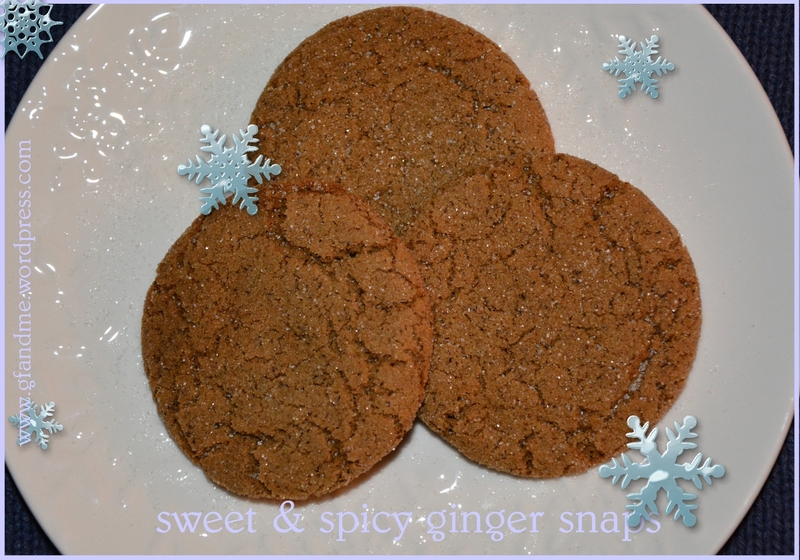 :3 Mum loves ginger snap biscuits, and now you’ve provided a great gluten-free version we can share! :3 thanks! You’re so welcome! Hope you and your mum enjoy them as much as we do! Thanks! Might make another batch this week. These ones didn’t quite make it all the way to Christmas. And thanks for your review of Luce’s sourdough. I haven’t seen the brand here in Alberta, but will certainly look for it.